Ads by Accelimize might start appearing on your screen if you install an application called Accelimize on the system. The application seems to be extremely useful at first sight because it promises to accelerate your internet speed automatically. 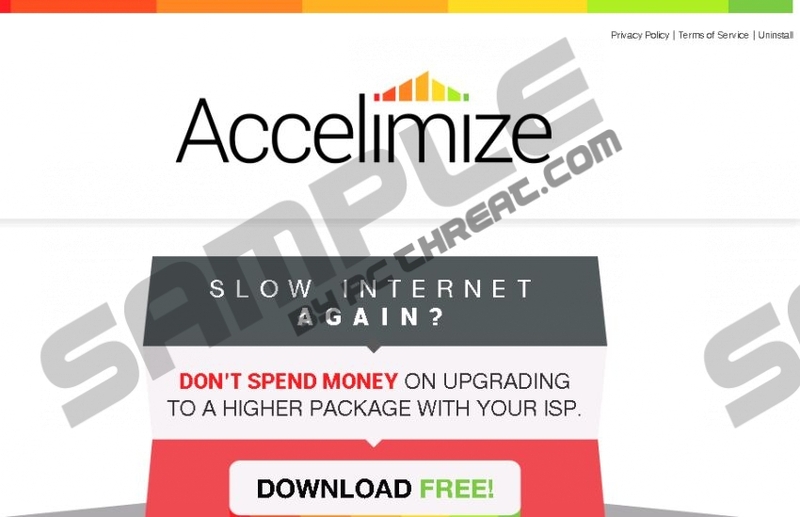 According to the information provided on its official website accelimize.com, it will allow you to download various files faster and play online games without lag. On top of that, you will be able to access different websites in a shorter period of time. As you can see, the application offers a number of useful features; thus, it is not surprising that computer users download it and keep it on the system. Unfortunately, it seems that it is very risky to do so; thus, we recommend that you get rid of Accelimize as soon as possible. One of the main reasons why we suggest doing so is the observation that the program is a typical advertising-supported application. Accelimize is compatible with all the browsers, including Internet Explorer, Google Chrome, and Mozilla Firefox; thus, there is a huge possibility that you will see Ads by Accelimize on all of them. It has been found out that these commercials might be very intrusive; thus, they might not allow you perform your daily activities freely. What is more, advertisements might lead you to the websites that contain malicious software; therefore, it is advisable that you delete Accelimize as soon as possible. If you do so, Ads by Accelimize will disappear from your screen as well, which is why we suggest that you do not postpone the removal process. This advertising-supported application is not unique. According to our security experts, it is very similar to such programs as Remarkit, VeriBrowse, and Passwidget. As the aforementioned applications, Accelimize might slither onto your computer rather secretly and start showing Ads by Accelimize. There are no doubts that you will notice its presence even if you have not installed it on the system yourself. In order to stop Ads by Accelimize from appearing, you will have to delete Accelimize application from the system. The program is not very useful at first sight; thus, it is not worth using it. We especially recommend erasing it from the system if you do not want to allow malware enter your system. We have prepared the manual removal instructions that will help you to do that more quickly. Feel free to use them and do not forget to scan the system with an antimalware tool. Locate Control Panel. Open it. Go to Uninstall a program. Select the unwanted program and then click the Uninstall button. Quick & tested solution for Ads by Accelimize removal.